Bootcamp prepared me to get a job, but not necessarily to do the job. A year and three months ago, I quit my nonprofit job to attend the Fullstack Academy of Code. My experience at coding bootcamp was textbook: I worked 80 hours a week. I hoarded take-out boxes from Uber Eats. I forgot the meaning of “sleep”. After those four months, I felt more than ready to dive in and excel as Junior Frontend Developer at Viget. Enter, reality check. Or rather, a CONFLICT (content): Merge conflict in index.html. There’s nothing like a Git error message to induce the cold sweats of imposter syndrome in a newly minted coder on her first week of the job. Coding bootcamps are generally successful in teaching you how to program — the basics, the language, the stack. However, they don’t necessarily teach you how to be a programmer — one with deadlines, client requests, and legacy codebases. Sweat-inducing Git errors would turn out to be just the start of this steep learning curve from bootcamp student to full-time programmer. Today — nine months into the job and a couple client projects under my belt — I’m still on the curve, but it’s getting easier to climb. Let’s take stock. Here’s what it’s been like to go from bootcamp to office, and what I’d do differently for a smoother transition. Thinking back to my first days at Viget, I can still feel the mild panic seizing my chest as I stared down the sprawling codebase for our company website, trying to figure out what went where. How long have I been staring at this again? Oh god, I don’t even understand how code is organized. Everyone’s going to know I’m an imposter. The first few months were overwhelming. Even simple things like code file structure looked byzantine in this real-life setting, miles from the safety of school. The simple seemed difficult; the complex, impossible. All of a sudden, I was responsible for knowing advanced frontend techniques that bootcamp never covered. This left me with holes in knowledge that had to be filled on the job, an extra burden on the stress of starting a new job. Git is a version control system used to manage code. But for us at bootcamp, it was more like the mean stepsister no one wanted to deal with. Using Git was messy and confusing, with its nonsensical terminal commands and inexplicable ways in which it refused to cooperate. 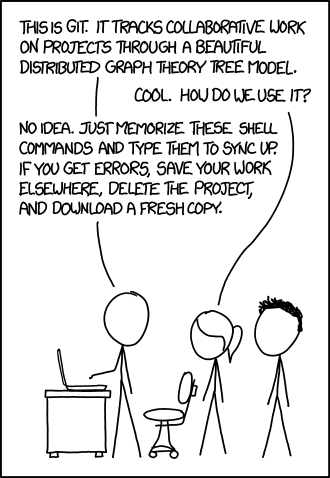 Most of us resorted to copying and pasting commands until something finally worked. So it was a rude awakening when I realized how important Git was to a programming team. We were expected to know how to submit code and resolve various conflicts. And now, working on client projects, I didn’t have the luxury of making mistakes and fixing them haphazardly. Like Git, I didn’t pay much attention at bootcamp when it came time to learn workflow tools and techniques. A two-hour lecture on Agile?! I’d rather work on My Cool Project! When I started at Viget, I was initially surprised by how much time I spent not coding. I worried I wasn’t doing my job correctly. It’s only recently I’ve come to realize that everything I do is a part of my job — not just the coding. As developers, we don’t just come in, write lines, and leave; we also track issues (GitHub), manage projects (Trello), log time (Harvest), and communicate (Slack). At Viget, I’ve learned that being a successful developer takes much more than knowing how to code. Main takeaway: a four-month coding program is not enough to hit the ground running at a professional dev job. But there are ways to make bootcamp count. Here are four tips on how to maximize your time at bootcamp to ease the transition from school to full-time job. Halfway through my program, I realized I liked to work on the frontend. That’s why I chose to focus my projects on the skills needed for that role, such as CSS animations and UI design for React. It’s crucial to figure out what you’re interested in and start specializing as soon as possible. This may sound counterintuitive — what about the million other things left to learn? In the long run, it’s much better for your job prospects to start getting good at something rather than being average at everything. The time I invested in going deep paid off by cutting down the amount of learning I had to do post-bootcamp. The best and worst part of my bootcamp was being required to do three presentations in front of the class — presentations that’d be uploaded on YouTube. As much as we despised it, being forced to present provided a great opportunity to learn how to communicate about code. It helped us become more comfortable with “dev lingo”, which I find to be one of the biggest factors of imposter syndrome. If your school doesn’t do presentations, try doing it informally with peers. Another unpopular part of bootcamp was having to code with a peer for six hours a day. We dreaded it — we wanted to “move fast and break things”, not “squirm nervously and play spell-check.” But learning to pair program is critical for new developers: it exposes us to different coding techniques, helps us consider new approaches, and builds communications skills. And it’s less weird than talking to a rubber duck. Pair programming helped me get better at problem solving and reviewing others’ code, two things we do every day here at Viget. At bootcamp, we’re often too distracted by the shiny new framework du jour that we forget the most fundamental part of programming — our computers. We use our computers for everything, from writing programs to debugging. It’s important to set up a work environment that’s conducive to these tasks. Every bonafide professional has their preferred arsenal of tools — things like your code editors, terminal programs, and package managers. Take time to learn the ins and outs of your arsenal, making an effort to understand what’s going on under the hood, rather than blindly copying/pasting commands. These tools may not get priority at bootcamp but they’ll be essential to your everyday as a professional. I hope my story gave insight on what life is like after a coding bootcamp. The “engineering talent shortage” is real, and bootcamps are invaluable for getting started. Don’t take them as the be-all end-all, but with the right preparation, you’ll be able to land a great job and excel at the job.